The world's largest container ship has arrived in the UK for the first time. The Hong Kong-registered CSCL Globe, measuring more than 400m (1,313ft) in length, docked at Felixstowe loaded with about 19,000 standard containers. Hundreds of spectators arrived along the coast to watch the ship dock at Felixstowe's deep-water berths eight and nine, which were opened in 2011, at a cost of £300m. Brian Hall, a shipping enthusiast watching the ship come in, told BBC Radio Suffolk: "It's an awesome sight. It is a great coup for the port to get the biggest container ship in the world into port. It is very prestigious." Paul Davey, from the Port of Felixstowe, said: We've had largest ships in the world before, but the ships do keep getting bigger and keep choosing the Port of Felixstowe as their UK port of call, which is good news for us. "It's good news also for the 30 odd thousand people in Suffolk who make their living in the transport industry." 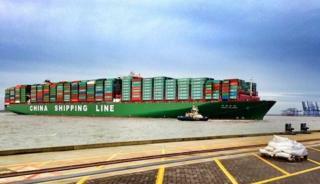 Local shipping journalist Chris Gosling said the CSCL Globe will be the biggest ship in the world for only a short time. "In about eight or 10 weeks there will be a bigger ship coming into Felixstowe, one called the MSC Oscar, which is capable of carrying about 120 more containers than the CSCL Globe," he said. "That's how we measure how big ships are. In actual length she is about four metres shorter than this ship." The port said ships of this size would not be able to use Felixstowe if it had not made the investment. It is carrying a large range of consumer goods including food, drink, clothing, electrical goods and furniture. The ship's last port of call was at Kelang in Malaysia.